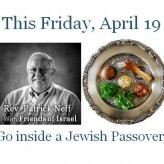 Join us for a fun and interactive look at one of the most sacred of Jewish feasts, the Passover. We welcome our Jewish friends and neighbors. Join us for an Easter Weekend that goes beyond eggs and bunny ears to the heart of what it means. Life is full – so many worthy things, so little time. We want to spend our lives in the things that matter most, but honestly the good often crowds out the best. Jesus’s answer to our dilemma is simply this: “But seek ye first the kingdom of God, and his righteousness; and all these things shall be added unto you” (Matt. 6:33). Join us on our journey in 2019 to make the kingdom the biggest thing in our lives. Jesus holds every believer accountable for fulfilling the command in this verse. 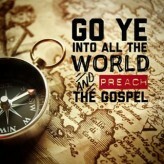 Preach means “to proclaim or share.” Every person who knows Jesus Christ has a moral obligation to share the gospel which is simply the Good News of salvation in Christ. Who are we to share this Good News with? “Every creature” certainly includes every single living person. Christ instructs us to carry this out in the context of our daily lives. The Greek word translated as go in this verse could be translated “as you are going.” We are a “going” group of people–we live busy lives. Today we will have many things that will demand our attention, and in the midst of that busyness, we can miss our purpose. God gives us the opportunity to meet people in order to share the gospel we know. As you encounter people today, look for divine appointments. Don’t Take My Right to Choose! Since 1973, a mother’s right to terminate a pregnancy in the United States has been protected by law. Many Christians believe the Roe v. Wade decision should be overturned. But should Christians expect everyone, even unbelievers, to be pro-life? The Bible teaches that every life, even in the womb is precious: “Thou has covered me in my mother’s womb. I will praise thee; I am fearfully and wonderfully made” (Ps. 139:13-14). But what do we say to people do not share this belief? The question comes down to one’s view of morality. Is morality formed by the consensus of the majority, or is morality superimposed from a higher authority? You may have heard that Wikipedia.org has suffered “friendly” sabotage from time to time, by those who artificially introduced content on certain pages that did not square with reality (i.e. existence of pink elephants). This tampering illustrates the fact that if consensus is allowed to determine morality, results can fluctuate with votes not truth. That is not only true of the web; it is true in real life. Just because 51% agree that stealing is now permissible would not make it right, nor would it reduce my angst if my neighbor took something from my garage. Lest you think my examples ridiculous, there have been cultures that practiced stealing as a way of life. No, the belief in morality is the belief in constants/universals that apply to all people in all places. One such universal is the belief in the dignity of every human life. Our country was founded on such a belief. Thomas Jefferson wrote that our independence was based on the fact that every person has the right to “life, liberty and the pursuit of happiness.” It is this fundamental belief that led to the elimination of slavery. And it is this belief that should lead to the end of abortion. Every life should be entitled to the freedoms protected by the Constitution. Civilized cultures have always championed life, not because of consensus, but because it is right. Call it what you will, but a developing, growing fetus is a life inside the womb, no different from a seed which contains the life of a full-grown plant within itself. The Roe v. Wade decision put the life of the unborn outside the protection of the Constitution, which was the same rational that was used to protect slavery in this country before the Emancipation Proclamation. No person’s freedom (i.e. a mother’s) should infringe or usurp the freedom of another. This is precisely what abortion does and this is why it is wrong in a moral society, regardless of one’s religious profession. Protecting life at every stage is the right thing in a moral society. Otto Koning in the Pineapple Story documents that a tribe in Papua New Guinea did not have a rule against stealing. Posted by Pastor Mike on Nov 6, 2017 in Blog, Uncategorized | Comments Off on SAFE at Church? People used to refer to houses of worship as sanctuaries, because they were a place of refuge or safety. But no more! The violence at houses of worship like Sutherland Springs, leave us all wondering where we are safe. Not at Walmart, not even in church?! Violence follows rejection of God. And the problem with America is that we are unwilling to go there. We already made that decision when we voted God and the Bible out of our schools a generation ago. Not wanting to endorse any one religion, we offered students no religion at all. But more was lost than religion; we lost a fixed moral reference point. And things have been deteriorating ever since. The anti-hate campaigns and the “be kind” bells cannot restrain a heart that has deified itself. So let the talk go on and on and on. Let the media tell us we need better laws, better education, better safeguards. Nope! We need better people. I wonder how much worse it must get before we invite God back? *D.L. Moody. Moody’s Sermons, Addresses, and Prayers. New York: Goodspeed & Co. 1877. p. 447.